Gabe was always a good sport in college for theme parties, and we just kept finding ways to keep the humor going over the years. 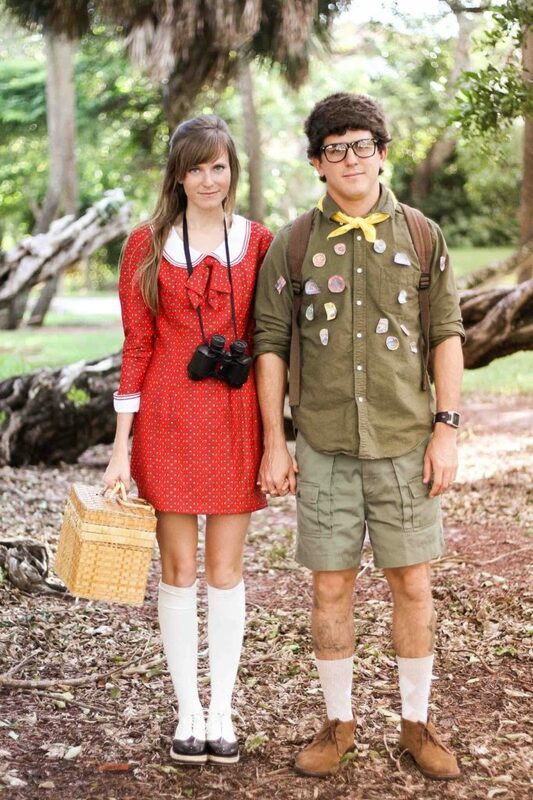 We rounded up 10 relatively easy couples costume ideas for you today, and I am super impressed with how legit some of these look! Read on for all 10 ideas. 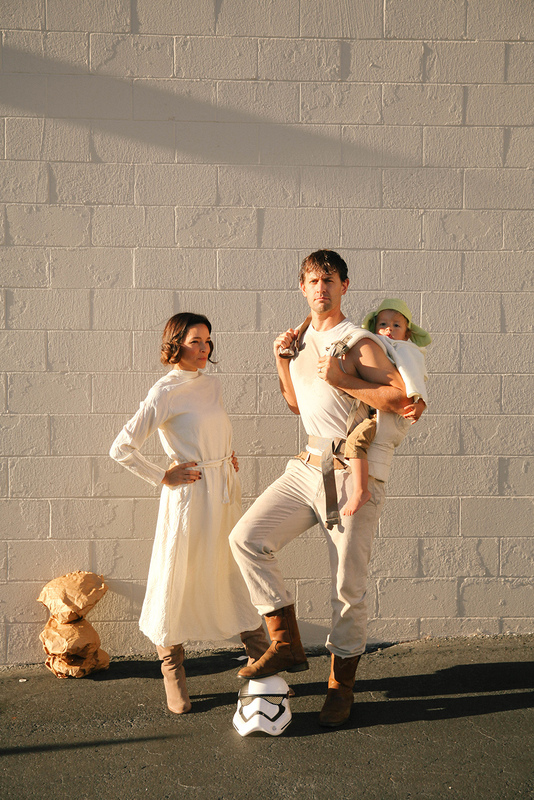 Luke and Leia – For our family costume last year we did a Star Wars theme (more on family costumes soon! ), so after all the kids chose their characters we ended up as Luke and Leia. (Gabe switched to Hans for trick or treat night – ha!) I couldn’t find a costume so ended up wearing a robe backwards with a pair of boots. Gabe decided to do the look from the Yoda and Luke training scene, and sweat stained an old tee to pair with some Khakis. If you have a little one, we used an Ergo Baby carrier to put yoda on his back. 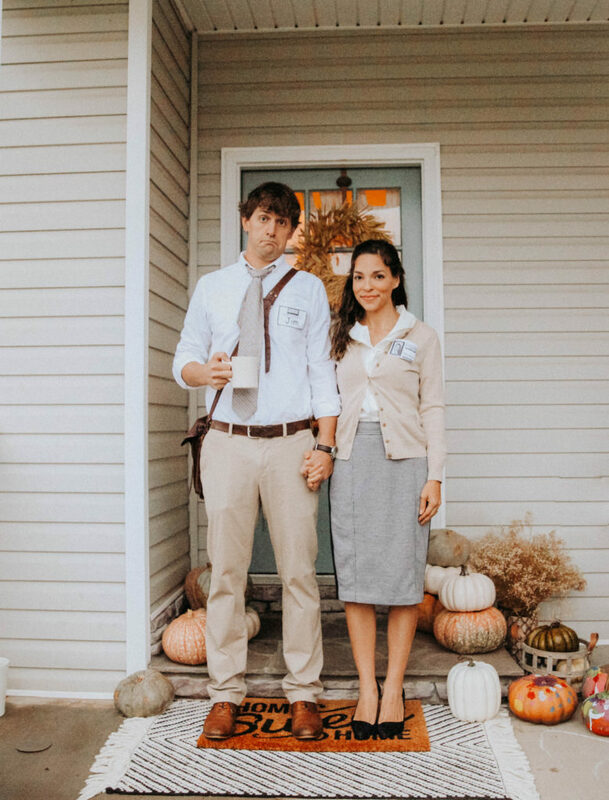 Gabe is constantly getting told he looks like John Krasinski so we finally played into the doppelgänger and went as Jim and Pam to our friend’s Halloween party! We printed the Dunder Mifflin name tags,and everything else we had on hand! It’s a great last minute costume to pull off. Holly Golightly and Fred – We have also been Lisa Turtle and AC Slater, John Smith and Pocahontas, and Holly Golightly and Paul Varjack “Fred” from Breakfast at Tiffany’s. Fred would be a good option for the guys who aren’t into costumes. 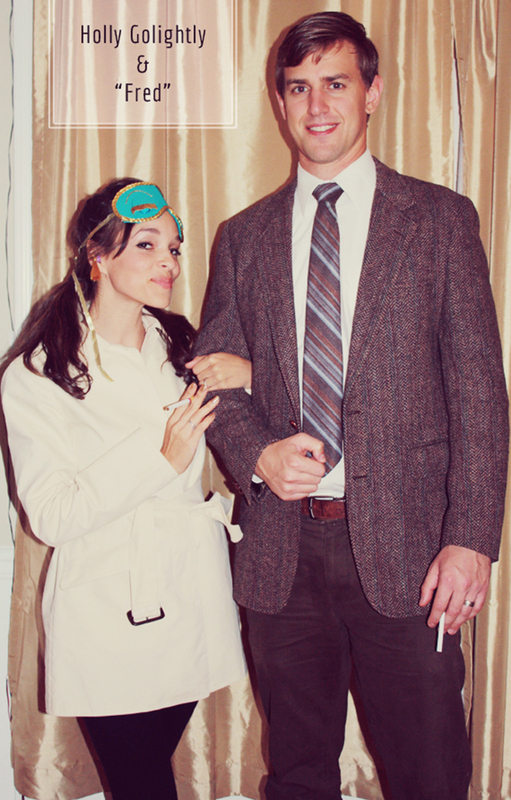 All you need is a cigarette and a vintage suit;) Gabe was really proud of that tweed blazer he found at GoodWill. (Here are 5 different Holly Golightly variations you could do!) Also shared this sleep mask DIY a while back! Photobooth props! This was from our friend’s wedding. Gabe would make a convincing Mr. Monopoly. 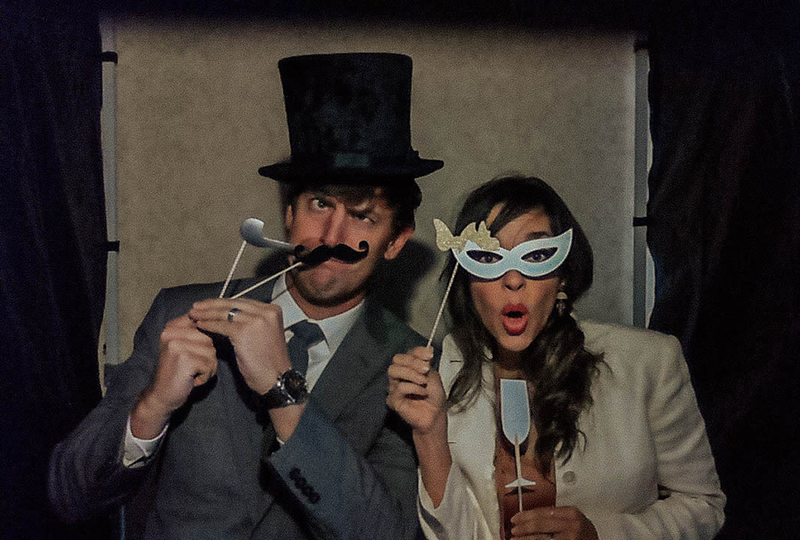 Make your own or pre-buy a pack of photobooth props for your next Halloween party. Milk and Cookies – Ok onto the professionals. Kelly Mindell comes out with the most genius ideas every year so be sure to head over to Studio DIY for endless ideas for couples, families, and friends. Bathtime Duo – Their son Arlo as the mesh bath sponge? I can’t get over this one! 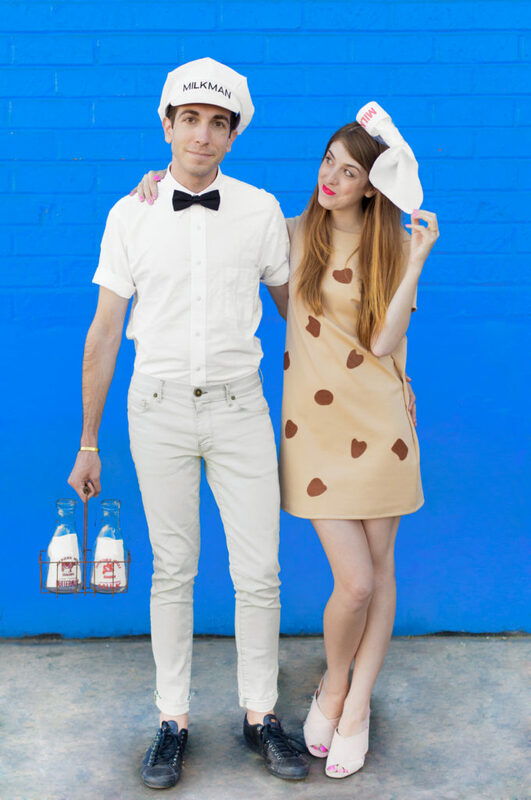 More of their couples and group costume ideas on Studio DIY. Moonrise Kingdom! I loved every detail of this couples costume from Steffys Pros and Cons. Etsy is a great place to find vintage dresses. Mimes – Have you seen New Darlings blog? 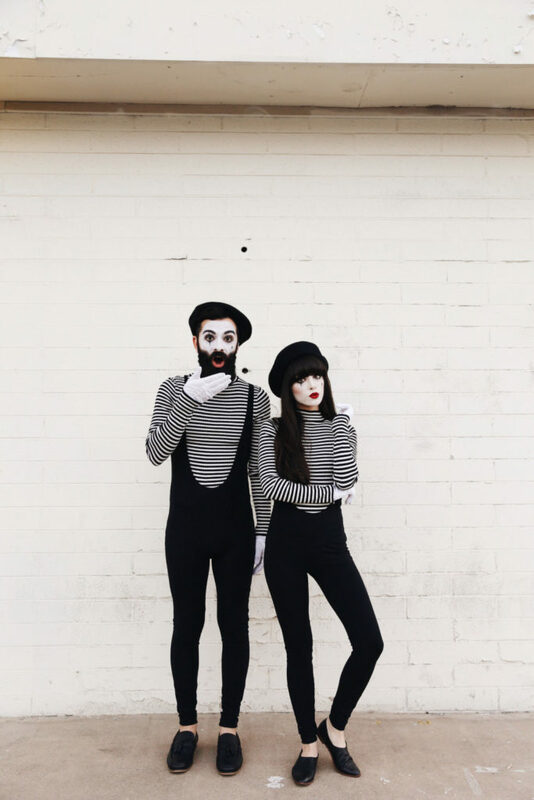 I love their content, and thought this was the cutest mime duo I had ever seen! This would be a great last minute solution with a few striped tees + black pants, and some good face paint. 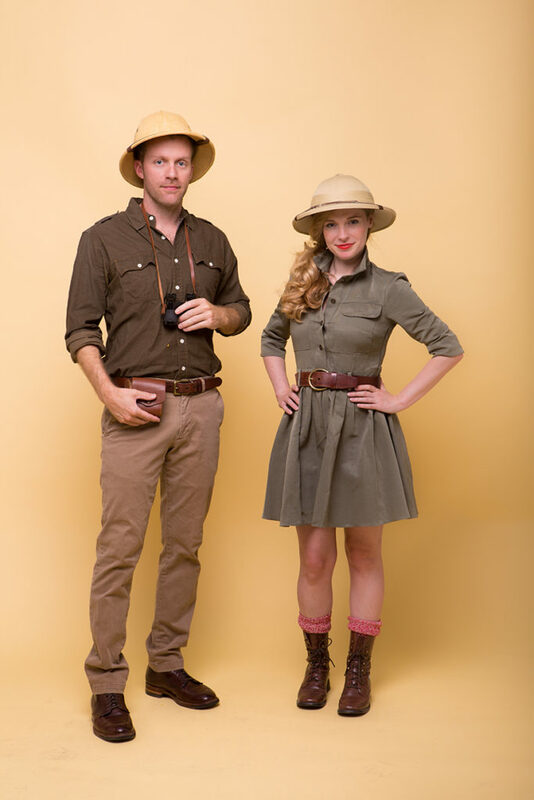 Safari Couples Costume – This would be another easy one to pull from your closet or hit up good will! Full DIY on Camille Styles. 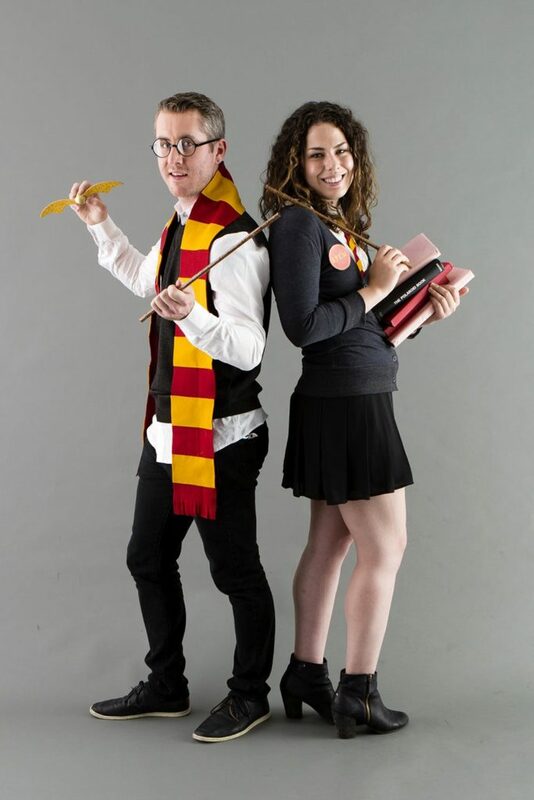 Harry and Hermoine – This costume actually seems doable! ($8 Harry specs from amazon.) Head to Brit and Co for the details on this pair’s costume. Hope these ideas help you out! 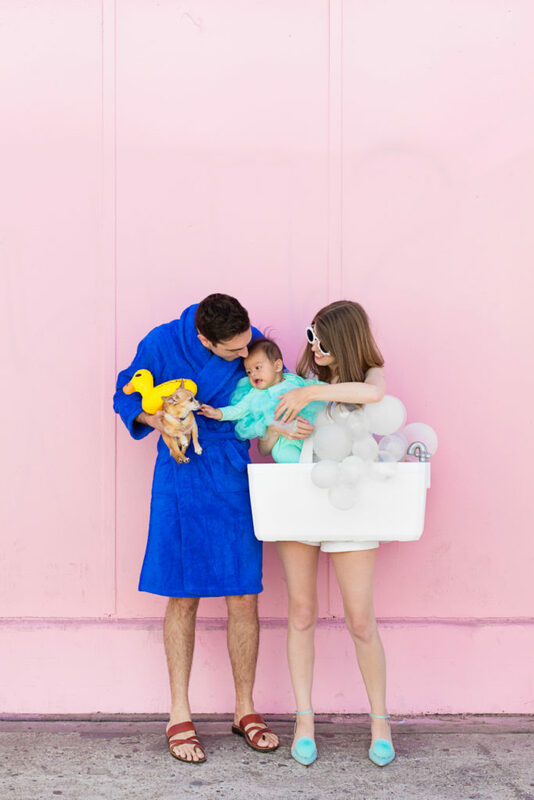 Have you posted a good couples or family costume on your own blog or instagram before? Drop them below, I thoroughly enjoy other people’s creativity!